Making this was a lot easier than it looked. It is a simple and impressive dessert to serve to guests. Line a Swiss roll tin with greaseproof paper (measurements 35x 25cm/ 14” x 10”). I did not use a proper Swiss roll tin so I used a meat tin the same size and it still came out alright. Put the 3 eggs and caster sugar into a bowl that will sit on top of a saucepan. Boil a kettle and pour a small amount of the hot water into a saucepan. Place the bowl on top but do not let the boiled water touch the bottom of the bowl. Now mix the eggs and caster sugar with an electric whisk until pale and thick. It should take about 5 mins. ( I found it easier to put the saucepan and bowl into the sink as I was at a better height to whisk and be careful of not spilling the hot water). When thick, remove the bowl from the saucepan, sieve in the flour and gently fold into the egg mixture also adding a tbsp of hot water. Pour the mixture into the Swiss roll tin and spread gently with a palette knife, then bake for 8- 10 mins in the centre of the oven until golden and firm. Gently peel of the greaseproof paper that was on the underside of the sponge. 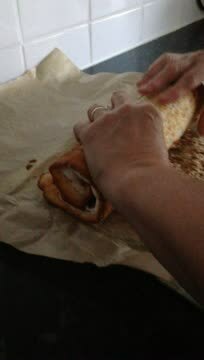 Now roll up the sponge along with the new sheet of greaseproof paper you turned it out onto to make a sausage shape. Place it on a clean tea towel and wrap it up and wait for it to cool. For the filling, mix together the fromage frais, almond essence and icing sugar. Leave covered in the fridge till ready to assemble along with the washed and sliced strawberries. Just before serving, unwrap the Swiss roll sponge from the tea towel but leave on the greaseproof paper as this helps to roll it back up when it is filled with the yummy filling. Spread the slab with the chilled topping and scatter over the mixture some sliced strawberries. Carefully roll up the sponge this time using the greaseproof paper to help support the sponge as you roll it back up, then discard. Place the strawberry roulade with the seam side down on a serving plate and lightly dust with icing sugar and decorate with strawberries and flaked almonds. So perhaps the healthy option is not your cup of tea, then why don’t you try out the naughty version. Instead of fromage frais substitute it for cream and instead of strawberries why don’t you try some blackberries for an added twang.